I’ve let a few months pass, so that the experience wasn’t so fresh. I had tried to be so organized and keep my calendar up-to-date so that I didn’t miss important things. You know the sort of things; vacations, doctor’s appointments, parties, the first day of school…. It’s hard. You get it. Life with kids gets busy, and sometimes chaotic. Calendars are of utmost importance. Well, as long as they are populated correctly, they are of utmost importance. On Wednesday morning, I started my grueling drive to the office and noticed little gangs of small children scattered throughout the neighborhood. “Awww, that’s cute,” I thought, “they’re practicing for the first day!” Next, I noticed a big yellow school bus (You know the ones. With the stop signs. ), and I thought again, “practicing for the first day”. The more tiny gangs of children I saw, the less confident I became in my trusty calendar. By the time I made it home, the children were kicked in to high-gear and ready to rock and roll. For this, I was thankful. They could have been much different. We got dressed in new duds. We got hair fixed for the obligatory photo shoot for social media. We sorted out lunches. We got back packs and smiles (and maybe a few tears on my part). We made a timely entrance to the fourth and fifth grades with swagger and panache. Nobody was the wiser – except for my grandmother, my kids, my co-workers, my family and a few close friends to whom I lamented my lack of organizational skills and litany of imperfections. How often is that the case, though? OK, you might not forget to take your children to school on the first day, but how often do you walk in with swagger and panache when five minutes earlier you were a whirlwind of eight kinds of crazy? Happens to me all the time. I am so thankful that I don’t have to keep it all together all the time. I am so thankful that God had me get the kids’ clothes ready a day early. I don’t typically do that. I am so thankful that my grandmother lives so close, and I didn’t have to drive across town to fetch the young’uns. I am so thankful for the disposition that I did not expect from those darling children of mine. If I forget to be thankful for the details that God controls when I’m not looking, would I forget to thank Him for the big things I’m protected from that are so clear and evident? I’m afraid I would. I know myself well enough, I’m very sure I would. That is why I need to be reminded to “Rejoice always. Pray continually. Give thanks in all circumstances; for this is God’s will for you in Christ Jesus” (I Thess. 5: 16-18). He’s got this. He keeps me. Of all the things He’s taking care of in my life, I only see a few; like back-to-school-clothes and tiny gangs of children practicing at their respective bus stops. In regards to looking impressive on the outside, I think you just might be impressed by the chocolate turtle cake I’m about to introduce. Its way easier than you think it is, so don’t be intimidated by how it looks. I cut some corners on this one, because I was being lazy—so it’s not from scratch (gasp!). This is not my normal M.O., but just accept it. I got my kids to school, OK? Chocolate frosting – whip this up. Seriously. Take it out of the jar and whip it. Into shape. Shape it up. OK, so I really recommend a stand mixer for this one. You will thank me. Dump the cake mix along with the substituted ingredients into the stand mixer fitted with a paddle attachment. Mix that loveliness together for 2 minutes. Grease and flour your cake pans, then pour equal amounts of batter in to the pans. Bake according to boxed cake directions. Turn cakes out on to a cooling rack and cool completely. While they are cooling, you have some work to do…. In a skillet, over medium heat, warm up the olive oil, pecans and salt stirring often. Heat these up for about 5 minutes, until they start to smell toasty. Remove from heat and let these guys cool their jets. Whip the frosting into shape. Whip it on high speed for 1-2 minutes. Use a spatula to ice the tops of two cakes, stacking one on top of the other. With the third, you will now have a tower. Ice the top of the cake and all sides. When the cake is covered in chocolate frosting, pour chocolate chips into your hand about ½ Cup at a time. Carefully press the chocolate chips into the frosting so they’re nice and stuck. Repeat this until the cake is covered. 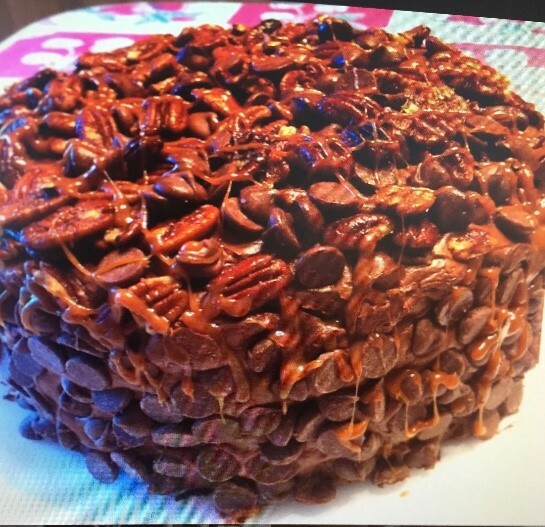 Distribute the pecans over the top of the cake, and then drizzle with caramel. This is so impressive on the outside, but really nothing fancy on the inside. Any (disorganized) momma (or daddy, I guess) could pull this off.